Solar Technology - As energy costs from fossil fuels continue to rise and solar technology continues to advance while coming down in cost, more and more property owners will integrate solar into their roofing systems. Since the roof of a structure captures the majority of the sunlight throughout the day and is often the most unused space of a building, the rooftop becomes the natural location for the solar panels. The solar movement will have a direct impact on what a roofing contractor in the 21st Century looks like as well as what other system components will be developed by roofing manufacturers as they race to capitalize on solar growth. Material Science Improvement - Asphalt based materials, which still control the lions share of the roofing market will see a steady decline over this century as newer, less expensive and longer lasting materials become more readily available. Prominent asphalt roofing manufacturers will advance their archaic manufacturing processes, while diversifying into newer materials. This transition will be forced by the laws of supply and demand as well as regulatory constraints. The refining process is more advanced than ever, thus leaving less and less asphalt or bitumen at the end of the refining cycle. The roofing manufacturers compete with asphalt road pavers for this supply. Combined with the rising cost of oil and greater regulatory demands for water use and you can see that the old days of hot-mop, built-up and asphalt roofing are numbered. Newer systems and manufacturing process formulations such as single-ply TPO, PVC, polymers, metal and future recycled formulations will become more and more common and carry a stronger thermal emittance value. Insulation a Part of the System - Greater insulation in the roofing system helps maintain a more ambient temperature in the building. This leads to less heating and cooling required throughout the year. As peak energy costs continue to rise, insulation such as rigid polyiso insulation board, will see stronger specification both in the commercial and residential roofing space and more people will look to improve their attic ventilation at the time of re-roofing. Reflectivity Ratings - White, or light colored cool roofs which carry a higher reflectivity rating than darker roofs, will continue to capture market share as concerns over global warming and rising energy costs remain. As Energy Secretary Steven Chu pointed out in 2010, "Cool roofs are one of the quickest and lowest cost ways we can reduce our global carbon emissions and begin the hard work of slowing climate change." Green Roofs - Not characterized simply by the "green" movement, these green roofs are true rooftop gardens with soil and native foliage. Green roofs carry a high insulation value, help reduce storm water run-off, reduce the "heat-island" effect and actually help protect the waterproofing surface of the roof by covering it from damaging UV rays. In congested, urban landscapes, where property values continue to rise and parks become less and less available, building owners will look to their unused roof for natural green space. Application Technology - Just as other industries, as materials advance, so to will the estimating and installation process. To some degree, the human aspect of installing and maintaining a roofing system may always remain, but advancements in technology will help to limit errors, reduce liabilities, lower human resource costs and improve roofing system specifications. The 21st Century will see newer measurement applications, more streamlined roof monitoring systems, roofing robotics during installation and more factory prefabricated materials rather than field fabricated systems. Commercial to Residential - Cool roof regulations which have been more stringent on the commercial side, will begin to be enforced on the residential side such as Title 24 in California. New, more advanced systems that typically penetrate the market on the commercial side of the roofing industry first, will also be incorporated on the residential side making residential homes more advanced and energy efficient as ever. The basis for these changes and new technologies will all be driven by a new generation of property owner, manufacturer and roofing contractor, the X and Y Generations. These same younger generations are leading the charge in robotics, IT development, media advancement, international distribution and overall communication around the globe. Combined with necessary cost reductions to energy production and a greater focus on sustainability and the future begins to look promising for continued change and advancement of a 21st Century Roofing Renaissance. 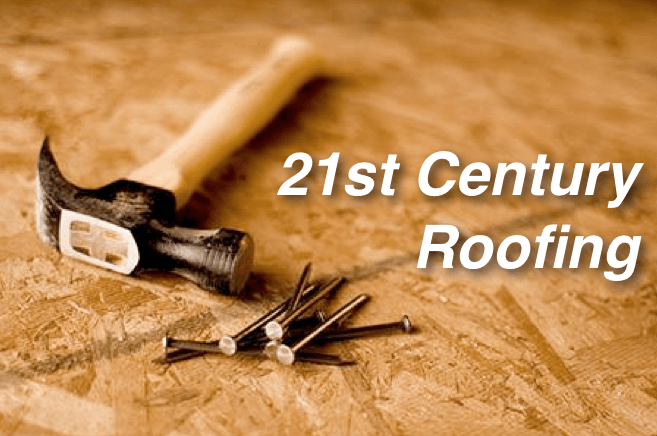 Help keep the 21st Century Roofing Renaissance alive, click the video below and engage with us in discussion on the topic.